Since I switched from writing A Little Slice of da Harbor to writing this blog, I shifted the focus away from adventure, seasonal attributes, events, and other aspects of life in da Harbor. But one aspect -- perhaps THE MOST IMPORTANT aspect -- of da Harbor has gotten a little too lost. Especially this time of year, she seems a little lost to me. I can't always hear her. I can't always watch her undulations. I can't always lose myself in her tumbling waves. Brady P. has been thoroughly confused as to why he can't throw rocks into Her Majesty Lake Superior. He looks at me in charming disbelief as we sit on our usual shores and he can't even see her. She is gone. "Where is Lake Superior?" I ask him? He swings his arm from side to side to motion to what he remembers as Lake Superior, but he doesn't seem convinced. "We can't see the water right now." I try to rationalize. "It is under all the ice and snow!" We dig into the snow as I describe it as white, soft and poofy. Then we touch the ice as I describe it as smooth, hard and shiny. Yup. The lake was under there for a couple weeks, if my memory serves me right. Since the temps were in the single digits, and the lake was frozen over, we did not venture down to our shore spots. No way. As much as Braeden hated that bitter cold, the shore was not the place to be. Besides, Her Majesty was hidden. But guess what. She came back! A couple nights ago the pack ice blew out of the Harbor. When I came home on Monday and saw her glimmering waves, I was elated. It's as if her life was renewed within me. It's as energizing as seeing the sun for the first time in days... or weeks. If you know this feeling, you are a fortunate soul. Appreciate that about yourself. Since the temps promised to rise into the 20's, I vowed to take Brady P. down to the shore on Tuesday. We haven't done that properly for a couple months, but he still asks me nearly every day to throw rocks. 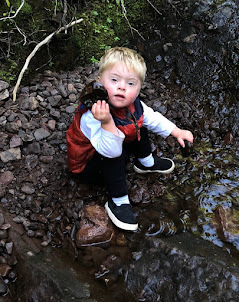 Fortunately, our sweet friend Bryce planned ahead and scooped up a bagful of rocks for a day just like Tuesday. So I put some rocks in a bucket and pulled Braeden in the sled down to the Harbor Haus shore. However, when we got there, I saw that my eyes deceived me from three blocks away. Sure, the pack ice blew out, and I could see the water, but it was covered by 1/2" to 1" of ice. We wouldn't have splooshes, but we would have a whole new experience. I chucked the first rock firmly, hoping to chip through the ice. No dice. Instead, that rock smacked hard, bounced and sliiiiiiiiiiiiiid over the glossy surface. It made a really cool sound. Lucky for you, I took a video this time. Brady P. was just as happy to chuck those rocks sailing across the ice. It actually lengthened the lifespan of each toss because we got to watch it slide so far. The sound was so unique. It was unlike anything I have heard before, and it wasn't my first time sliding rocks on Lake Superior! Well, I'm glad you got to be a part of that with us. Here's hoping that magical aspect of Copper Harbor can stay a bigger part of our daily lives besides sending us all those snowflakes!